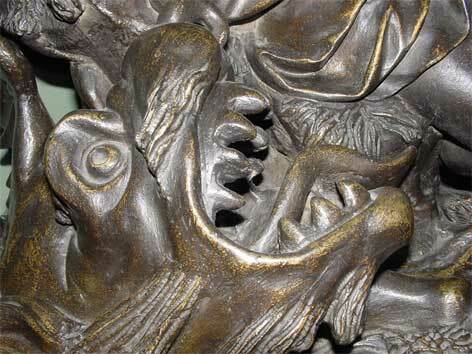 This sculpture is a rare, interior lead, thought to date from the late seventeenth century, retaining its original bronzed finish which was created using an early metallic paint, finished with a glaze. Along with some structural damage, the surface coating was also damaged in several areas. Samples of the highly important surface coating were taken, and a selection of the results of the analysis are shown below. The analysis showed that the decorative surface was built up in several layers. The first was a base coat of grey paint whose function must have been to provide a good key for the bronzing layers; the second consisted of two layers of brass filings in an unknown medium, mixed with iron oxide yellow pigment; the third was a coat of oil, tinted with red and brown pigment including some vermillion. The existing uneven colour of the sculpture was due to patchy wear of this now discoloured glaze, exposing the yellowing metallic paint underneath. 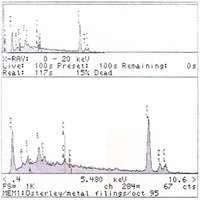 A dispersion was made of the metallic coating and viewed in transmitted light. 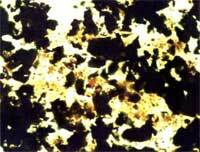 It shows the fine, bright yellow particles of a good quality iron oxide yellow. The black shapes are the brass filings. 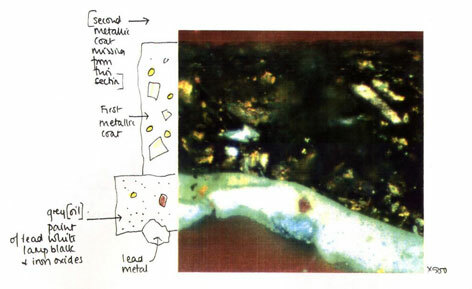 EDX analysis of the metallic coating showed large peaks of copper (Cu) and zinc (Zn) from the brass filings. The lead (Pb) is probably contamination, the calcium (Ca) is difficult to explain - it could be from chalk or from calcium sulphate as the sulphur and lead peaks overlap. The sculpture had sustained structural damage: the right arm was broken off and the left knee and the top of the head were flattened by impact, and the left leg was split. 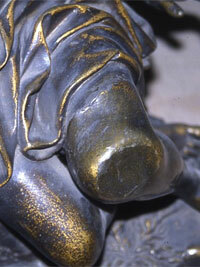 Conservation involved the removal of the damaged leg at the existing split to enable the reforming of the knee. We then worked on the flat part of the head from inside the sculpture, gaining access through the base. In both these areas we had to take out the existing core material which obstructed access to reshape the form. The cuts and the existing splits were very carefully lead burned together. This was difficult due to the painted surface, so great care was needed. Following the results of the paint analysis, we were able to make up a very similar coating to retouch the surface when the repairs and finishing work were completed. 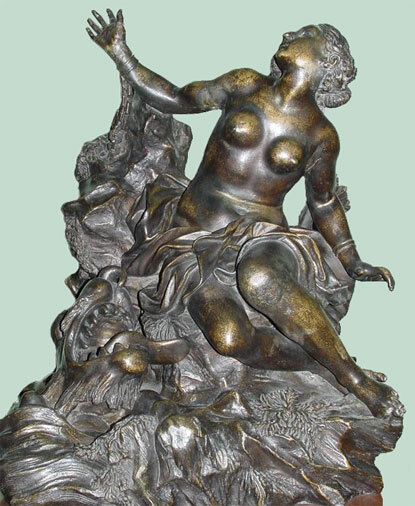 In Greek mythology, Andromeda was the daughter of Cepheus and Cassiopeia, king and queen of Aethiopia. Cassiopeia, having boasted herself equal in beauty to the Nereids, drew down the vengeance of Poseidon, who sent an inundation on the land and a sea-monster, which destroyed man and beast. The oracle of Ammon announced that no relief would be found until the king exposed his daughter Andromeda to the monster, so she was fastened to a rock on the shore. Perseus, returning from having slain the Gorgon, found Andromeda, slew the monster, set her free, and married her in spite of Phineus, to whom she had before been promised. At the wedding a quarrel took place between the rivals, and Phineus was turned to stone by the sight of the Gorgon's head (Ovid, Metamorphoses v.1). Andromeda followed her husband to Tiryns in Argos, and became the ancestors of the family of the Perseidae through Perseus' and Andromeda's son, Perses. Perseus and Andromeda had six sons (Perseides): Perses, Alcaeus, Heleus, Mestor, Sthenelus, and Electryon, and one daughter, Gorgophone. Their descendants ruled Mycenae from Electryon down to Eurystheus, after whom Atreus got the kingdom, and include the great hero Heracles. According to this mythology, Perses is the ancestor of the Persians. 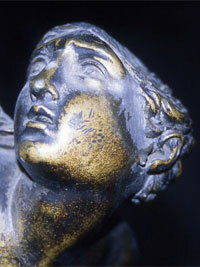 After her death she was placed by Athena amongst the constellations in the northern sky, near Perseus and Cassiopeia. Sophocles and Euripides (and in more modern times Corneille) made the story the subject of tragedies. 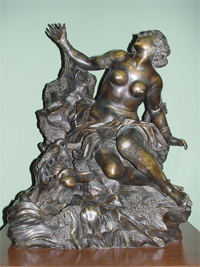 The tale is represented in numerous ancient works of art. Andromeda is represented in the northern sky by the constellation Andromeda which contains the Andromeda Galaxy.